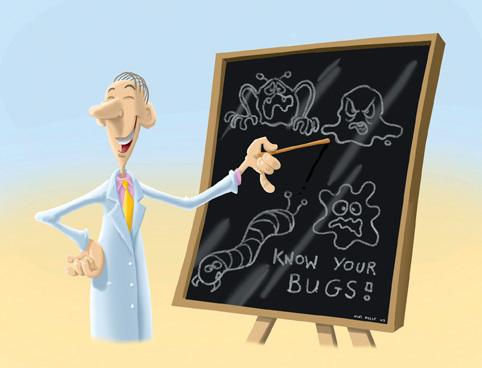 The human body has developed general and specific defences against infection. General defences protect the body against all infections and examples include skin, secretions such as tears, cilia (tiny hairs), which filter air entering the lungs, and body washings, such as flow of urine from the bladder, which washes away bacteria with the urine. Specific defences develop when the body's immune system produces antibodies against certain diseases. These antibodies develop after an infection (e.g., chicken pox) or after vaccination (e.g., whooping cough, rubella) and ensure that infection or re-infection very rarely occur. People with kidney disease are vulnerable to the same infections as the general population, such as flu, measles and mumps. However, they are more vulnerable to certain infections due to the treatments used (haemodialysis, peritoneal dialysis and transplantation) and due to regular hospital admissions (MRSA, VRE, and C.Difficle). 1. Bacterial infections associated with access, i.e., catheters, fistulas and grafts. 2. Blood borne viral infections (hepatitis B, C and very rarely HIV). See chapter 4 (Book 2) for detailed information on infection associated with access. Patients with known infections are treated in single rooms, on special machines. All equipment used, on each patient, is either disposed of after each use or cleaned and disinfected after every use. See chapter 5 (Book 2) for detailed information on infection associated with Peritoneal Dialysis. See chapter 8 (Book 2 and Book 3) for information on infection, associated with transplantation. MRSA is the shortened term used when referring to Meticillin Resistant Staphylococcus Aureus. Staphylococcus aureus (S. aureus) is the name of the bacteria. The sensitive strain is found in the nose and skin of 20-30% of healthy people. The resistant strain (MRSA) means that it cannot be treated with antibiotics normally used to treat the sensitive strain. MRSA is most often found in hospitals or nursing homes where antibiotics are used frequently therefore encouraging the development of resistant strains of bacteria. How does a person acquire it? MRSA is transferred from one person to another by human contact. The main method is on hands, during patient care. Patients, who are carriers, may pass it on to other patients if they are in close contact. Does MRSA make a patient more ill? Some patients are colonised with MRSA and others have infections caused by MRSA. A patient is colonised with MRSA when he/she has no signs or symptoms of infection. It does not alter their treatment and is not a reason to stay in hospital. MRSA infection, like other infections, varies from mild to severe and depends on other factors, such as where the infection is, and the patient age and underlying conditions. A person found to be colonised or infected with MRSA will be nursed separately from other patients, in a single room (isolation), or in a room with others who also have MRSA (co-horted). A patient, colonised with MRSA, is treated with special washes and ointments. A patient, infected with MRSA, is treated with antibiotics, in tablet or by a drip into a vein. VRE is the short-term used when referring to Vancomycin Resistant Enterococci. Enterococci are bacteria found in the faeces of humans. Most of the time enterococci are part of the normal bacteria of the bowel and do not cause disease. A strain of enterococci has developed resistance to vancomycin, which is an antibiotic used to treat serious infections including MRSA infections. VRE is found in hospitals where patients are very unwell, such as intensive care, kidney and transplantation wards. Enterococci can survive on surfaces, ledges and floors. How does a person acquire VRE? VRE may be transferred from one person to another by direct contact, particularly from hands, during patient care. Does VRE make a person more ill? This varies from patient to patient. The majority of patients are colonised, whilst some are infected. Colonised means that the VRE is not causing infection. The presence of VRE colonisation does not alter their treatment and is not a reason to stay in hospital. VRE infections can vary from mild to severe and depends on factors such as the site of the infection and the patient’s overall condition. Patients with VRE, in a wound or in a urine specimen or those having diarrhoea, need to be nursed in a single room (isolation) or nursed in a room with other patients with VRE (co-horted). Infection, with VRE, is treated with antibiotics usually given in a drip in a vein. Colonisation with VRE does not require any special treatment. What is Clostridium Difficle (C. Diff)? C. Diff. is a bacteria that causes diarrhoea and may cause intestinal conditions such as colitis. It is a common infection in hospitals and long-term facilities. The use of antibiotics alters the normal bacterial content of the bowel and, thereby, increases the risk of developing C. Diff. diarrhoea. Where is C. Diff found? C. Diff is found in the bowel of some people and can also survive for a long time on surfaces. How do people get C. Diff? Healthy people are not at risk from getting C. Diff. People who have other illnesses or conditions requiring prolonged use of antibiotics and the elderly are at risk of infection. They can become infected if they touch items that are contaminated and then touch their mouth. Does C. Diff make a person more ill? In most patients, the symptoms are mild and discontinuing treatment with antibiotics and fluid replacement results in rapid improvement. Sometimes, it is necessary to give a specific antibiotic, by mouth, for the condition. Unfortunately, 20-30% of patients relapse and need further courses of antibiotics. Patients need to be nursed in a single room (isolation) or, in a room with other patients with C. Diff (cohorted), until bowel movement has returned to normal. Pneumococcus - This bacterium can cause serious infection in the lungs (pneumonia), the blood (bacteraemia) and covering of the brain (meningitis). Vaccination consists of a single injection, followed by a once-off booster dose 5 years later. Influenza (flu) - An annual flu vaccine is advised, as infection can be complicated by pneumonia, which is dangerous for people with chronic illness. Hepatitis B - Hepatitis B is a serious illness and as haemodialysis is a recognised risk for acquiring Hepatitis B vaccination is advised. The vaccination course varies, depending on the product used, but it is usually 3 or more injections, over a 6-month period, with a follow-up blood test to check if immunity has developed. Some people need an additional injection (boost) or a repeat course to develop immunity. In addition, people on haemodialysis or peritoneal dialysis have a blood test, yearly, and, depending on the result, may need a boost. Varicella (chicken pox) - Vaccine for patients not immune and planning to receive a transplant. People should not get the vaccines if they ever had a life-threatening allergic reaction to yeast (Hepatitis B), eggs (flu) and/or to a previous dose (all vaccines). Pregnant women should discuss vaccination, with their doctor, and people who are ill should defer vaccination until feeling better. While a vaccine, like all medicines, is capable of causing a serious problem, such as severe allergic reaction, the risk of vaccinations causing serious harm, or death is extremely small. Getting vaccinations is much safer than getting the disease. What Can Patients Do To Help Reduce The Spread Of Infections In Hospitals? Washing hands or using alcohol gel after using the toilet and before meals. 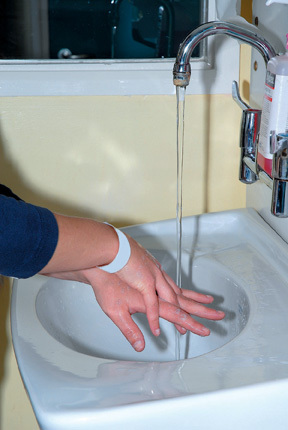 Reminding staff to wash their hands, or use alcohol gel before they care for you. Advising visitors who are feeling unwell not to visit. Advising visitors to wash their hands before and after visiting and to avoid going from one ward to another during visiting time. Seeking advice from ward staff if young children wish to visit. Complaining to the ward sister/consultant or any staff member if the general ward hygiene is not satisfactory or if staff are not washing their hands. Increasing space between beds and number of single rooms especially a new wards are built.